While koi ponds in warm climates can remain as they are all year round, ponds that see colder temperatures must be properly winterized before the water surface freezes over. Letting nature take its course could be devastating to both the pond and the fish inside. With careful planning and precautions, you can keep your beautiful koi healthy and safe even after the weather gets cold. The most important way you can keep your fish safe through the winter is by very thoroughly cleaning the pond of debris, leaves, sticks and dead fish. When organic matter decomposes under water, it pollutes the water and becomes toxic waste. Use a net skimmer with a long handle to completely remove any debris and dying organic material. There are a couple of ways to guarantee that your pond has proper aeration during the winter months. (Aeration ensures there is enough oxygen circulating throughout the pond for fish to survive.) If the local temperature does not often dip below freezing, you can simply break the thin crust of ice at the surface of the water whenever it forms. If you have consistently cooler weather, you might consider installing a floating water heater that will keep the surface warm enough that it won't freeze. Many people choose to remove filters and pumps entirely when it gets cold outside to prevent them from freezing and cracking. Without a filter pump, you'll need an alternate method of keeping water from becoming stagnant. Use a temporary fountain kit to cycle water in the pond. If the winter temperatures stay relatively mild, however, you can keep the pump in the pond. Check the pump regularly to make sure it's functioning properly. During the cold season, continue to clean and skim out any debris particles that may accumulate in the pond. Check the water temperature regularly, break up any ice that has formed and monitor the health of your koi. Do not overfeed in the winter. 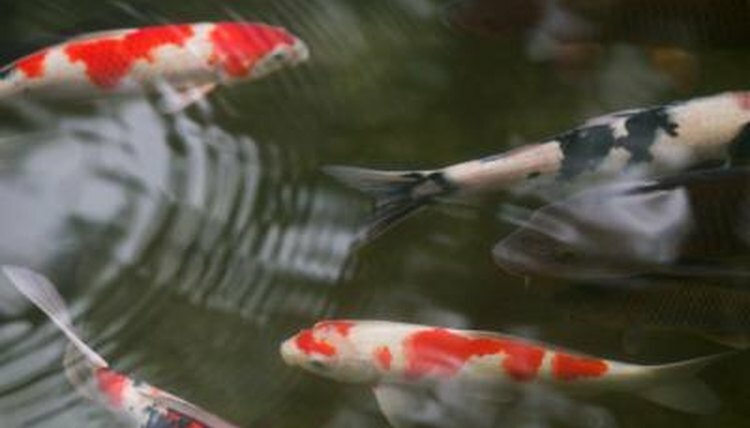 Koi metabolism slows down considerably when the temperatures drop, and excess food will build up and become toxic to the fish.